Burgess Meredith and Hugh O'Brien. It was like Time Tunnel without the tunnel and the time travel. 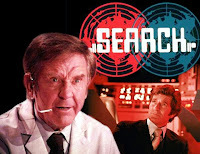 That's one way to describe Search, a 1972-73 TV series that combined science fiction elements, international settings, and handsome private eyes. Burgess Meredith plays V.C.R. Cameron, a project director that provides intelligence data to three field operatives for the World Securities Corporation. Each operative is outfitted with high-tech devices that allow two-way communication with Cameron and his staff, one-way video surveillance, and the monitoring of health vitals. By accessing a powerful computer loaded with useful data, Cameron can provide any information the operatives may need--from a street address to a biography of someone they just met. 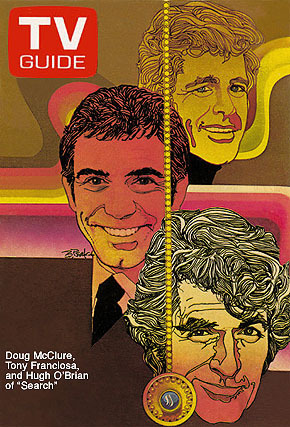 TV Guide cover with the stars. It's an intriguing premise that sadly grew old within a few episodes. It didn't help that the show's structure--which focused on a single operative each week--made it difficult for viewers to identify with the hero. One week, the star was Hugh O'Brien as the cynical Hugh Lockwood. The next week, it was Tony Franciosa as tough guy Nick Bianco. And lastly, there was Doug McClure, who looked like he should still be playing Trampas on The Virginian. Of course, there have been popular shows with rotating stars, such as Maverick and The Name of the Game, but they also featured better-written characters. Leslie Stevens, who created The Outer Limits, wrote the pilot for Search, which aired as a made-for-TV called Probe in 1972. It was a cut above other telefilms of the era, thanks in part to guest stars Elke Sommer and John Gielgud. It also featured Angel Tompkins as one of Meredith's assistants, who bantered playfully with O'Brien (a more lighthearted version of Lee Meriwether;s character in The Time Tunnel). 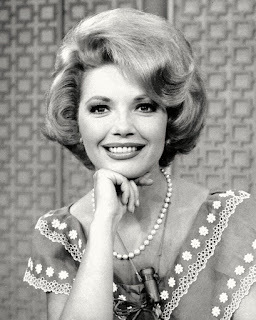 Tompkins remained for the first episode of Search, but then disappeared from the series after a second appearance. 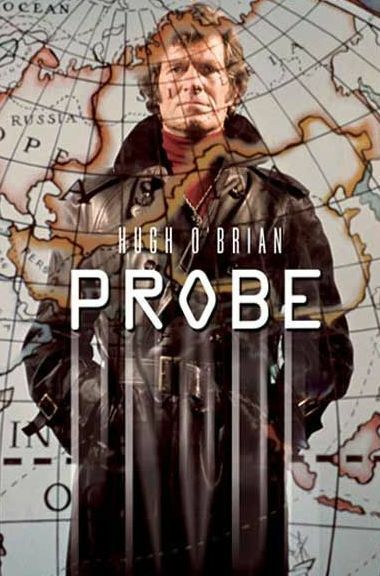 (Incidentally, the original plan was to call the TV series Probe, but that idea was scrapped to avoid confusion with a public television series). "Search" a more prescient title for a high tech show. "Probe" is just, well, ouch. Frontiere had a history on writing great themes for failed shows. Like the short-lived IMMORTAL - a contradiction in terms. Hugh O'Brien publicly complained about his character being a remote controlled pawn, promised to become more pro-active.The show changed producers after that. I watched this show when it first aired and enjoyed it at the time. Never thought I'd see it again but someone uploaded it to the Internet and I was able to see every episode. Still found it enjoyable! Tony Franciosa's Nick Bianco character was my favorite of the three agents. I agree that Tony was the best of the three! I'd come for that theme, and it would get me to stay. I don't remember this, but I would like to get a look at it, even though those "what might have been shows" always leave me a little melancholy. PROBE wasn't a bad title. I remember there was a popular board/card game by that name in the '70s. I saw the pilot film awhile back and it was just okay. I'd enjoy seeing the series, especially the Doug McClure eps, sandwiched between his VIRGINIAN run and co-starring with Shatner on BARBARY COAST, but the series is prohibitively priced ($36 on Amazon, which set doesn't include the pilot). 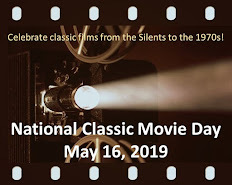 The titles and theme sure are memorable, and this episode would be fun for this BEWITCHED fan reuniting Sam's father Maurice Evans and Darrin's boss David White. Good post on a promising series. Yes, that was a great BEWITCHED connection! Great theme song and graphics! Very 1970s-esque. Holey moley, that Doug McClure had a lot of hair. I don’t remember the series well but I did enjoy the theme music! The show premiered in the Fall of my first year of Junior High and while I watched it regularly the episodes seemed a bit mundane and the technology preposterous for the time (the bogus computer graphics were also a bit clunky). Worth it alone for Burgess Meredith, the music and the very cool Probe Control set. The premise could have worked with sharp writing, a little visual flair and stronger rotating cast but things steadily went down hill after the reasonably entertaining pilot. The show really nose dived after NBC booted Stevens and brought in a hack producer who moved Probe Control into a dingy brick room set and steered the plots into standard private detective territory. Worth noting Star Trek's Robert Justman handled the nuts and bolts of the producing. Did anyone else get the Viewmaster set and novelization for Christmas? It's funny no one ever commented at the time how much the basic premise of "Search" resembled that of the seemingly forgotten first season of "Mannix" wherein Joe worked for a high tech corporate detective agency. Neither attempt clicked but I have a soft spot for both. Both shows had cracking theme music.